Am I not a human and alive? 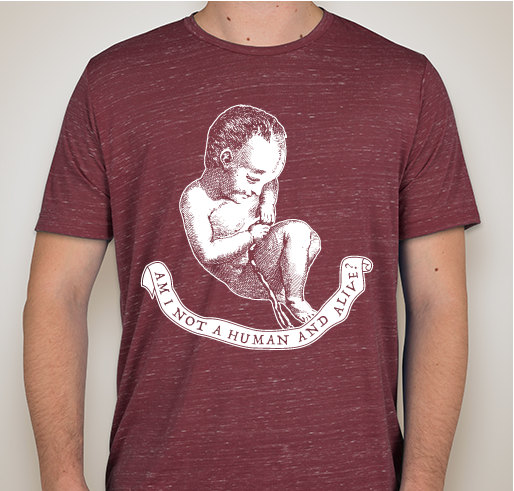 Buy this shirt to help raise funds for mothers and babies in need! All funds raised will go directly to Sanctity of Life Ministries . Everyday, there are mothers throughout Northern Virginia who need help in their pregnancy. Amazing organizations like Sanctity of Life Ministries offers compassionate support, education and medical services to those who face challenging sexual health decisions. In order to help further their goals of reach more mothers in our area, I've designed this t-shirt based on the engraving "Am I not a man and a brother?" by Josiah Wedgewood, which was used to promote slavery's abolition in the UK. 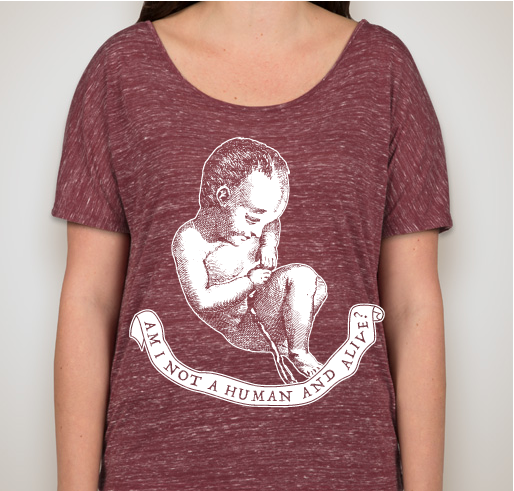 I've replaced the "supplicant slave" with an engraving of the fetus (latin for "young in the womb") and the words have been changed to "Am I Not A Human And Alive?" The choice to emmulate the Wedgewood engraving is very intentional. Just as those involved in or allowing of the Slave trade in the past believed that Africans were somehow subhuman, many who advocate for or are allowing of abortion have considered the babies in the wombs of their mothers as somehow subhuman and less deserving of rights. When you wear this shirt, you will be pleading the case of the unborn to all who view it AND through your donation, helping women and their children throughout Northern Virginia! Thank you for checking out this fundraiser and I hope you decide to help us reach our goals! Proud to wear my pro life world view. As an employee of SLM, I'm so grateful to see more members of the community starting conversations on the sanctity of life and the need for compassionate help for women in crisis in our community - thank you Life Community & Pastor Ryan!! To help women and children in NOVA. Share Why You Support "Am I not a human and alive?"